Said The Whale’s trailer was broken into while on tour in Sacramento, CA. Thousands of dollars worth of gear and clothing were stolen, including Tyler and Ben’s guitars, Spencer’s cymbals and two glockenspiels. 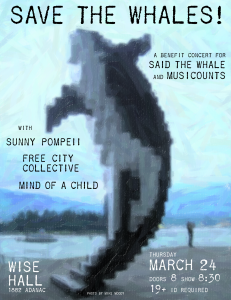 This show will raise funds for Said the Whale and a portion of proceeds will also be donated to MusiCounts, a Said The Whale-approved charity that supports music programs in schools all across Canada. When Spencer Schoening isn’t touring around the world with Said The Whale, he plays in an intriguing psychedelic band. Aubrey Ellefson, Joel Reid and Simon Marmorek will be performing as a trio. Longtime friends and collaborators Ben Rowley and Theo Milloy are joined by Jun Choi, Derek Rohde and Sam Romero to produce unquestionably Canadian indie rock. Mind of a Child is the result of the childish minds of four North Vancouver musicians – singer/guitarist Oliver Browne, bassist Brendan Steele, drummer Max Ley and keyboardist Kevin Holman.